I am taking a small break from teaching hands-on workshops for the year of 2019, but I have THREE on-line workshops available through the Create Along website. Full descriptions are below and links are also listed on my NEWS page. 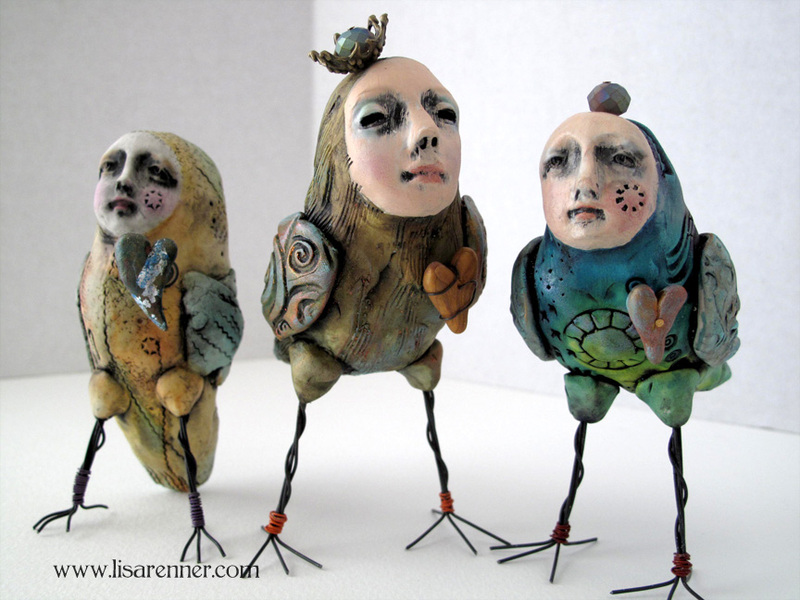 These are small, quirky figures that you will fabricate using polymer clay and other mixed media materials. Standing about 3-4” in height, they are huge with personality and charm! In this workshop I will guide you through the basics for sculpting your own original rustic faces for these figures that will portray one-of-a-kind expressions and characteristics. BYE, BYE BIRDIE: In this workshop you will be making two whimsical pieces of art, each integral to our Bye Bye Birdie theme- A hot air balloon, and a Bird Peep as aviator. What’s a Bird Peep you might ask? It’s a small polymer clay bird with a little human face! First you will construct a (15-18” total height) hot air balloon using easy to acquire materials. I will show you two different ways of crafting the balloon itself, and we will discuss a number of surface options for the polymer clay covered baske,t including image transfer. The second part of the workshop will be focused on fabricating a “Bird Peep Aviator” to pilot the balloon! (Who better than a bird to fly it, right?) This is a jolly process because as you build your Peep, you’ll see its personality emerge and you won’t be able to contain your own smile! To further complement the theme, I will show you how to make a simplistic set of small goggles and corresponding aviator hat from my own vintage-inspired design so your little Aviator will be ready for its travels! Skills to be learned: Forming a simple bird armature, sculpting and texturing the bird with clay, application of alcohol inks, chalks and other surface material, working with wire to fabricate the bird’s feet , how to make and work with face molds, construction of a small hot air balloon, image transfer on clay, quick paper mache, and more. BATHING BEAUTIES: In this online workshop I will take you through all the steps to create your own sculptural art doll bust using polymer clay, ink, paint, and your imagination! These little “Bathing Beauties”, encircled by their colorful inner tubes will delight you as you picture them swimming in an ocean, or floating in a pool on a summer’s day. Working step by step, you will learn how to make and work with face molds to create a face for your figure, fabricate a simple armature for the head, body and inner tube to which you will apply polymer clay, sculpting and texturing as you go using easy-to-find implements. Antiquing and color application including the make-up will be demonstrated which really brings your Bathing Beauty to life! Variations and embellishments including making a sea-themed necklace will also be shown. I hope you will join me for some fun with polymer!